Lewis Moody will be at the fulcrum of England’s World Cup campaign this autumn. So to get you in the mood for the tournament Rugby World has teamed up with Morrisons to offer you the chance to win an England shirt signed by the flanker. We have two shirts to give away in this competition, exclusively for Morrisons customers. 1. 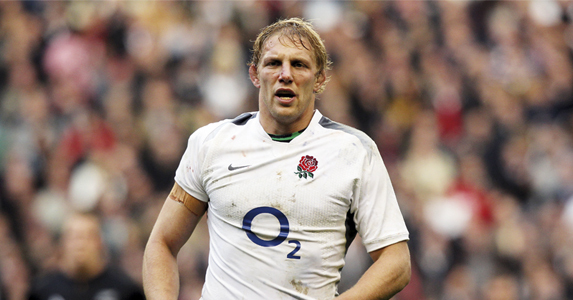 Against which country did Lewis Moody make his England debut in 2001? 2. What was the score when England played Scotland at Twickenham in the 2011 RBS 6 Nations? Once you have your answer email rugbyworldcompetitions@ipcmedia.com. Please include the address of the Morrisons store in which you bought your copy of Rugby World in your entry. You must complete your entry by Monday 5 September 2011. Normal IPC Media rules apply – see below. The editor’s decision is final. This competition is open to all readers except employees and their families from IPC Media Ltd, Rugby World’s printers, and companies associated with the competition. Only one entry is permitted per household. You MUST provide a day-time phone number with your entry. No purchase necessary. Prize must be accepted as offered. There can be no alternative awards, cash or otherwise. In the unlikely event of a prize being unavailable, Rugby World reserves the right to offer an alternative prize of equal or greater value. Proof of posting cannot be accepted as proof of delivery. No responsibility can be accepted for entries that are lost, delayed or damaged in the post. No correspondence can be entered into and no entry returned. The Editor’s decision is final. If space allows, results may be published in a future issue. Entry implies acceptance of these rules. While every effort is made to ensure prize details are correct at time of going to press, Rugby World can’t be held responsible for incorrect prize details supplied by sponsors. Winners must be prepared to cooperate with publicity arising as a result of winning a prize, and their contact details may be passed on to the competition sponsor. The shirts cannot be sold on – for clarification, email paul_morgan@ipcmedia.com. See rugbyworld.com for details of winners. Promoter: Rugby World, IPC Media, Ninth Floor, Blue Fin Building, 110 Southwark Street, London, SE1 0SU.